Known for its customizable mattresses designed based on a proprietary Helix Sleep Quiz, Helix was one of the first companies in the mattress industry to offer customizable mattresses available online. Customers can take a quiz to share preferences about sleeping positions, sleeping partner preferences, and current issues with sleeping, pain, and temperature, among other sleep-related information. Based on the sleeper’s profile, Helix will recommend a mattress and design a custom mattress to offer a balance of both comfort and support tailored to each sleeper. Helix does not rely on the one-size-fits-all concept, which makes it stand apart from other bed-in-a-box companies. 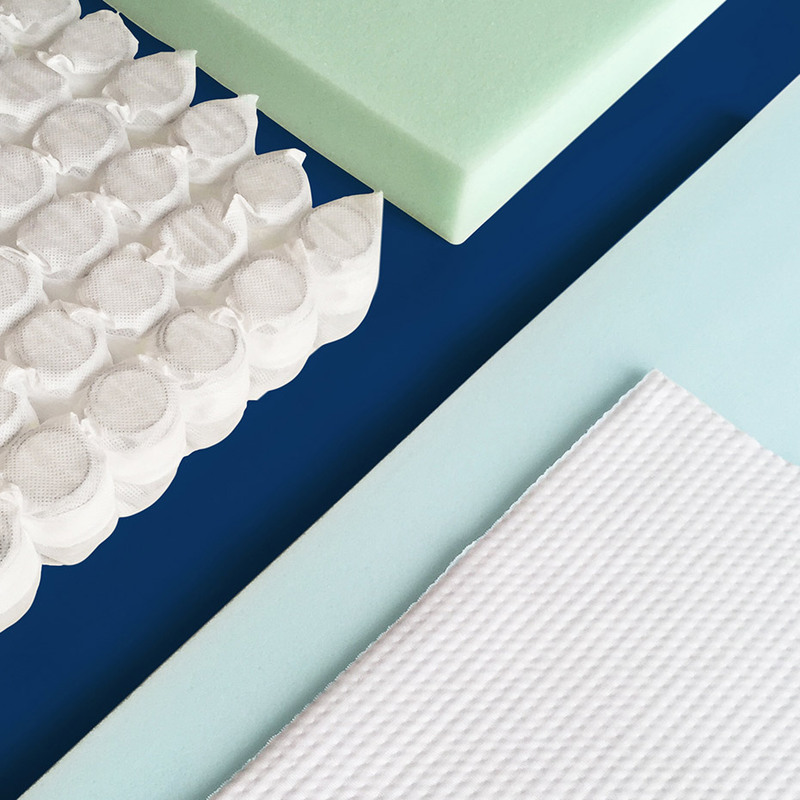 Helix Dynamic polyfoam: This material is not memory foam or latex, but a proprietary polyfoam that is certified by the CertiPUR-US and designed to be contouring, cooling, and offer comfort and pressure relief. Pocketed microcoils: These microcoils help distribute weight evenly across the mattress and offer some bounce and reduce motion transfer to other parts of the mattress. 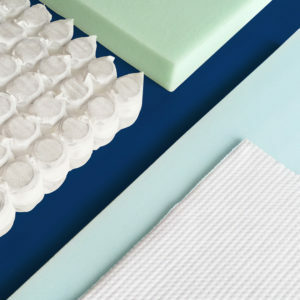 Polyfoam: This high-density foam is certified by the CertiPUR-US and gives the mattress a strong and durable foundation that supports natural spine and body alignment and helps support the other layers. 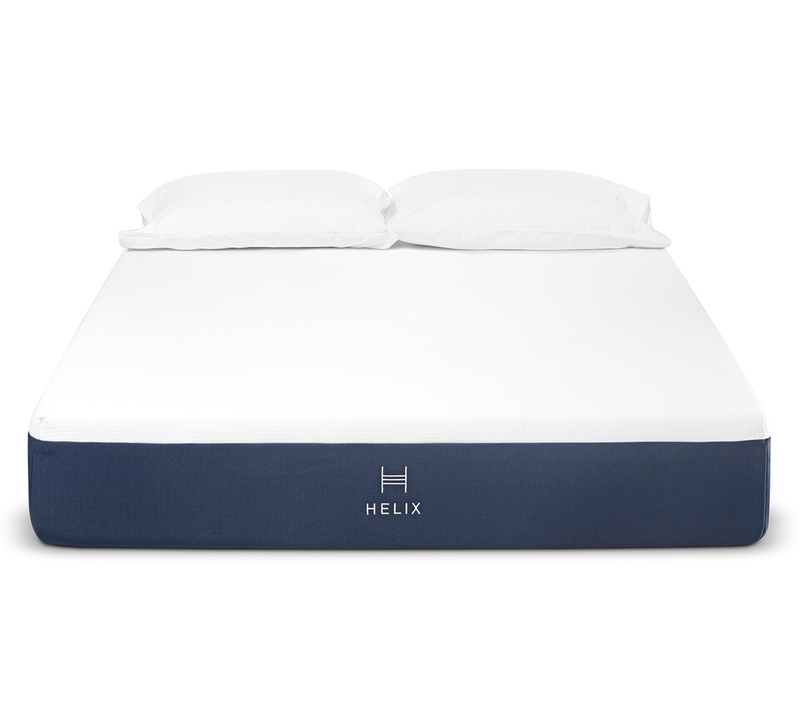 Price: Helix is competitively priced compared to other mattress brands available online and in stores. Personalization: A variety of options are available for sleepers with Helix mattresses, and the company designs each mattress based on sleepers’ preferences. Comfort: The combination of Dynamic foam that offers pressure relief and body contouring and the microcoils that offer weight distribution makes this mattress perform well in providing consistent comfort and pressure relief specific to each sleeper. Sleep trial and return policy: A 100-night sleep trial gives sleepers a chance to try out the mattress. The company offers free removal and full refunds. Edge support: This mattress performs like many other foam mattresses in this category. When pressure and weight is applied, the edges of the mattress sink down significantly more than the center core of the mattress. Company rating: Helix has not been rated on Better Business Bureau, so there isn’t data available for consumers to access. Warranty: A 10-year warranty is considered to be average for the mattress industry, and other competitors offer better warranties. Buy your Helix mattress from Amazon. Helix was one of the first companies in the mattress industry to offer a completely customizable online mattress buying experience. Company founders were inspired to start the company after their poor experiences. All Helix products are made in the U.S., and the company is based out of New York. The company does have a showroom in New York, and customers can schedule appointments to work with a specialist. What makes Helix unique as compared to other direct-to-consumer online mattress companies is they don’t rely on a one-size-fits-all model. Recent articles about Helix are available online here. Helix has not been rated by the Better Business Bureau (BBB). According to BBB, the no rating status means that the BBB doesn’t have sufficient data on the company yet. Helix specializes in hybrid foam and innerspring mattresses. Each mattress is 10-inches thick and features a combination of layers. Depending on a sleeper’s preference, the configuration and specifics of each layer may be different. Comfort layer: This is a 2-inch comfort layer of proprietary Dynamic foam that is designed to be responsive and offer pressure relief. It is known to have some similar characteristics to latex. This layer has excellent body conformity, cooling properties, great bounce, and it responds quickly to movement. Comfort and support: The second layer is a 2.4-inch layer of pocketed microcoils that offers both comfort and support. The coils help evenly distribute weight across the mattress, relieve pressure, and add additional support to the mattress. These microcoils also add bounce to the mattress, help absorb movement for to isolate motion, and promote airflow to help sleepers stay cool. Transition: A third support core layer is made with 2 inches of poly foam and serves as a transitional layer for added support. Support core: The fourth and bottom foundational layer is a 4-inch support core layer made with high-density foam. Cover: The mattress does include a cover that can be removed for easy washing. Purchase the Helix mattress from Amazon. Helix offers a 100-night sleep trial. The sleep trial starts the day the new mattress arrives, and sleepers have up to 100 days to return the mattress for a full refund. Helix will arrange for the mattress to be removed from the home. The company says that refunds will take between 5 and 7 business days to be issued. Any mattresses that are returned and are gently used are donated to charity. The company will offer exchanges for sizes, but not for design for configuration or customization. Helix offers free shipping to the entire United States and ships directly to customers’ doorsteps from the factory. For mattresses being shipped to Canada, there is a $150 fee. Each mattress is compressed, rolled, and packaged to be shipped in a box that is 16” x 16” x 48”. The company ships via UPS Ground. Mattresses are usually delivered between 4-8 business days after purchase. The company does not ship internationally outside of Canada, and can’t ship to PO Box, APO, or FPO addresses. Helix offers a 10-year non-prorated warranty. This covers manufacturing defects and is available to the original purchaser of the mattress. The mattress performs well in this category, based on the conforming nature of the comfort layers and the responsive design of the microcoil layer. The layers work together to absorb movement, so motion felt on other areas of the mattress is minimized. The Helix mattress performs fair in this category along with other similar foam mattresses, because the edges sink down when pressure and weight is applied. The edges are not sufficient in supporting sleeping or sitting directly on the edge of the mattress, and the mattress’ center core offers the most support to hold sleepers up. These mattresses are considered to last about 6 to 10 years on average. The Helix mattress can vary on firmness based on the customized mattress designed for each sleeper. That said, there are many firmness options available because each sleeper’s preferences are different. The Sleep Quiz will help sleepers determine what level of firmness they prefer. Sleeping hot is a common complaint for foam mattresses, and the Helix model is designed to keep sleepers cool with several built-in cooling technologies. The comfort layers — foam and microcoils — are both designed to allow airflow and prevent heat trapping. A slight odor may be detected upon unboxing and installing the mattress, but it will dissipate within a few hours of setting up the mattress. Helix mattresses do offer some bounce, because of the microcoil layer and responsiveness of the comfort foam layer. Each Helix mattress does include a cover that can be removed for easy cleaning, however, the company suggests that it not be removed. 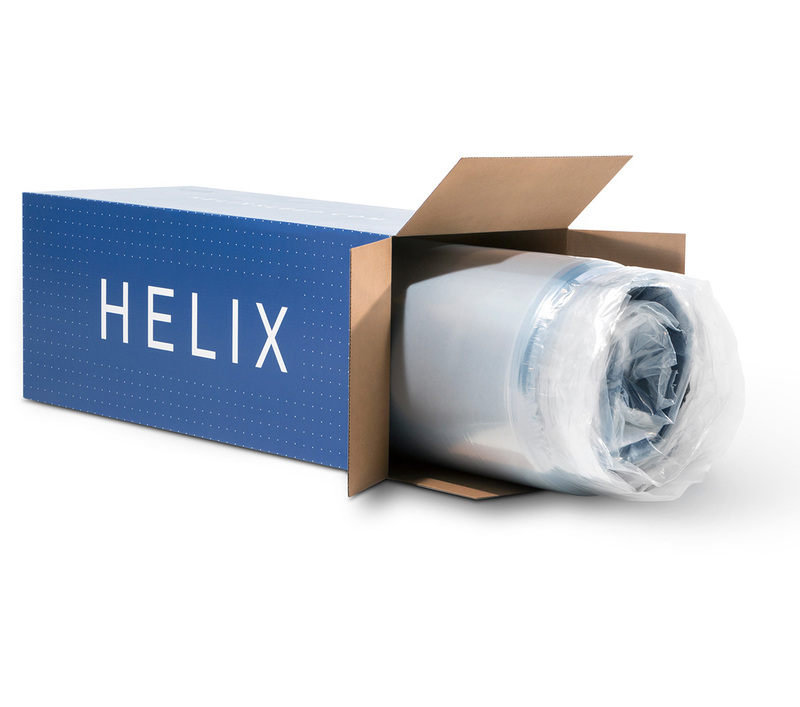 Instead, Helix recommends that sleepers use a mattress protector to prevent spills, tears, stains, and accidents. The cover should not be machine washed or dried, bleached, or dry cleaned. If needed, the cover can be spot cleaned with gentle soap and cold water. The cover should be dried completely before bedding is put back on the bed. 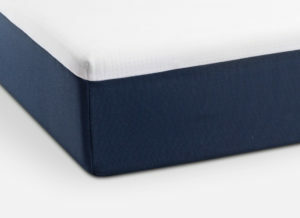 The Helix mattress should not be flipped because the personalization on each layer is to remain consistent with the blue fabric/support core layer on the bottom of the mattress. Helix recommends rotating the mattress only if customers feel like it, however, it is not necessary for the mattress.